Litres: 26 litres total capacity. This tank will let you use your 690 as a true adventure bike, giving a combined fuel capacity of 26 litres. The tank fits on as an addition to the original under seat tank. It is straight forward to install and easy to remove and replace for servicing. There are taps to isolate the fuel in both tanks so servicing can be done without the need to drain fuel (fuel must be drained for initial instillation). 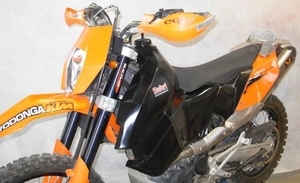 This capacity over doubles the range (original tank 12L) and has been molded to retain the original KTM styling and look, and gives you a unique, comfortable knee position on the tank.